No Class Fanzine - ZineWiki - the history and culture of zines, independent media and the small press. 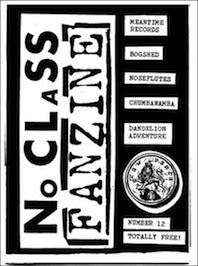 No Class is a fanzine from the UK produced by Graeme Barnes and Joel Chernin. No Class Fanzine emerged in the 1980s. It featured interviews with punk and post punk bands such as Killing Joke, Red Beat, Ski Patrol, Chumbawamba, The Voletones, Androids of Mu, The Satellites, The Decorators, Martian Dance, Motor Boys Motor, Crass, Flux of Pink Indians, The Committee, Ritual, Pigbag, Test Dept, and many others. This page was last modified on 4 January 2019, at 07:51.